As anyone who knows me can attest, I love crows. And magpies, and blue-jays, and really…all upstanding members of the corvidae family. These sturdy little mischief-makers are the smarty-pants of the bird world. And, in my opinion (sorry blue-footed booby), the most handsome. 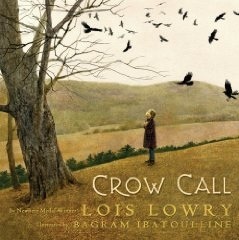 It’s no surprise that picture books about crows attract my attention, and three have made it to my shelves: Crow Call by Lois Lowry (illus. 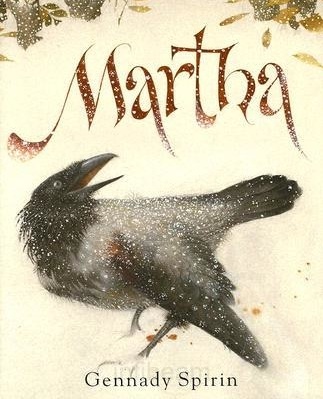 by Bagram Ibatoulline), Martha by Gennady Spirin, and Crows: An Old Rhyme by Heidi Holder. Crow Call is a perfect example of why it can sometimes be hazardous to judge a book by its cover. The one in question is a gorgeous, contemplative scene picturing a young girl staring up at a sky full of circling crows. In the subdued autumnal colours, the illustration is resonant of Andrew Wyeth. This is no mistake as the illustrator, Bagram Ibatoulline, dedicates the book to Wyeth, his favourite artist. Wyeth is one of my favourite artists too, and Ibatoulline’s work is certainly a standout in my collection. Don’t be fooled. In Crow Call, the illustrations between the covers are mostly a disappointment. Lois Lowry, a writer of many very fine novels, tells a story (based on her own experiences) of a hunting trip with her father, recently returned from the war. Even though the crows are ultimately spared, I am uncomfortable with the premise of hunting and that threat of imminent violence colours my experience of the book. The figurative illustrations throughout are realistic, which is also (but not always) problematic. On the whole, I tend not to like realistic depictions of humans – in both the illustrative and narrative sense – in children’s picture books because it often signifies a drearily didactic treatment of the subject matter. While this isn’t the case with Crow Call, which is written beautifully and sensitively, the interior illustrations are drab and ponderous. A disappointment, because Ibatoulline has created several exquisite picture books including The Tinderbox, which I will review at a later date. However, ya gotta admit, the cover is awfully nice. Martha, by Gennady Spirin, is also based on a true story. The cover is stunning and the art is primarily figurative, but it succeeds where Crow Call fails because the story is pro-crow and the illustrations of humans are humourously stylized, even though they depict Spirin’s own family. Martha is an injured crow who is rescued by Spirin’s son, Ilya. She ingratiates herself into the family, as crows will do, and once her wing is healed, flies away, leaving the family in a state of enchantment. It’s a pretty simple story, but as I’ve already discussed in another post, Gennady Spirin is a supremely gifted artist, and his illustrations always elevate the story to a higher plain. 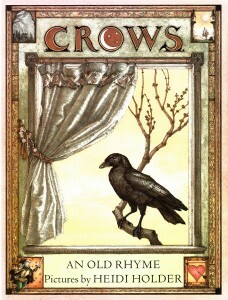 Crows: An Old Rhyme by Heidi Holder is a lovely thing to behold. It’s a throwback to a style of illustration that seems to have fallen from favour in recent years, when watercolour was more translucent, and everything had an outline. Twelve number rhymes, visualized as a series of accumulating crows, tell the fortunes (and misfortunes) of a weasel and a mink. The number of crows depicted on the left hand side of the book correlate to various superstitions controlling the fate of the weasel couple on the right side of the page. Each illustration is within a decorative border, although crows being crows, they defiantly spill out from the edges. 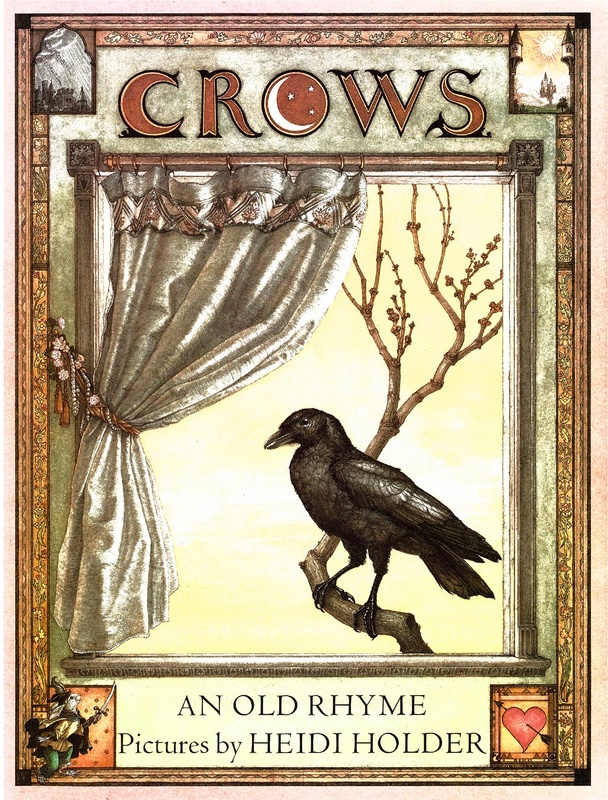 The crow-laden rhymes inspire the liveliest and most fetching paintings in the book. Other characters, including Mr & Mrs Weasel, remain confined within their borders. However, in each frame the vibrant colours and mysterious imagery pervading this folktale provide a rich backdrop to the weasly dramas unfolding in the foreground. It’s very detailed work, and there is a key to the symbols at the back of the book. I do believe it’s possible to judge a book by its cover. Two of the three books mentioned are beautiful within and without. However, I bought Crows: An Old Rhyme and Martha in a bookstore, where I was able to flip through the pages. Lesson learned: go ahead, pass those judgements, but make sure you get to know a book before you take it home. Still…nice cover!